The invasive species was found in a duck pond and is thought to have been dumped there after being purchased from a pet store. A strange fish, usually living in the Amazon River, has been found in a body of water in California. The fish, a relation of the menacing pirhana, was found in Petaluma Pond in San Francisco and has created a mystery as to how it ended up so far from home. Fisherman Juan Gallo got a shock as he reeled the toothsome creature in and found it wasn’t quite what he was expecting to see. 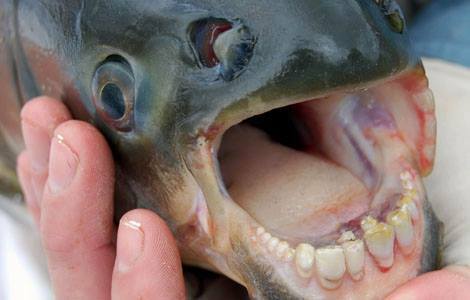 The pacu is unusual because it possesses, what resembles, human teeth and causes havoc when introduced to new ecosystems. Since it is not native to North America it is thought to have come from the wide number of pet stores that sell them, however, owning one in the state of California is illegal. Gallo says he will try to hand over the toothy specimen to the California Department of Fish and Wildlife (CDFW) but will gladly stuff it as a memento if they don’t want it. The pacu is most known for attacking the testicles of men bathing in the Amazon River and could pose a threat to those taking a dip where they fish have been dumped. Invasive species have become an increasing problem in the U.S. with native species suffering as a consequence of these being introduced to ecosystems.